Those of you who were loyal Jeff n’ Jer listeners back in the day when local radio morning shows flourished, probably remember the duo going back and forth over breakfast orders with Hani. I go there from time-to-time when I need to grab a bite to eat. And I must admit, that even though I am a self-proclaimed non-star-struck person, I get a little nervous seeing Hani. That’s stupid, right? He’s a regular guy who fell into local celeb status. Hani has a huge personality and talks to everyone that comes in the door. Since I listened to him on the radio for years, I feel like I know him a little even though he doesn’t know me. It is not just the atmosphere that is good; the food is good too. I generally get their wraps or salads, but they have a huge and very diverse menu. The tuna artichoke wrap and the Thai chicken wrap are my favorites. They have awesome gyro salads as well. Today when I walked in to pick up my Thai chicken wrap, Hani said to me “Hello baby. I made your wrap 2 lbs. today.” I laughed at him, but he wasn’t kidding. It was a lot of food. 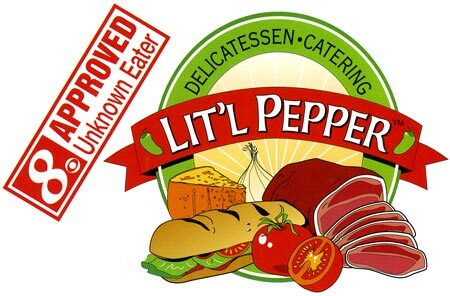 Lit’l Pepper is definitely worth a try – if for nothing else but to meet Hani. I guarantee you’ll like the food too.